Cook the chayote squash cubes along with some curry leaves and salt in a little water till tender. Add the ground mixture to this and cover and cook for about 5 -7 minutes. Add the buttermilk and cook for another 2-3 minutes on very low heat. Heat the oil and temper with the ingredients listed above. 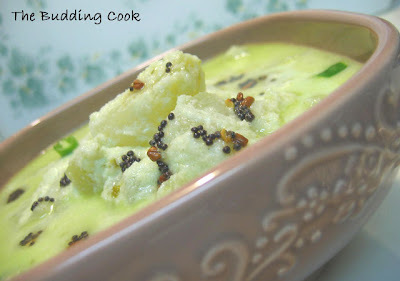 Serve hot with rice and pappad. this is something I greedily idulge in when I visit my folks! Ooh, intriguing. We usually have chayote just stirfried. This looks like a must-try to spice up our chayote. I love morkootu but have never tried making it with chow chow before.. only the white pumpkin. Yours looks pretty, with the seasoning on top. Do let me know if you do try it out.